The Hunter Trail is only 4 miles round-trip. Another trip to Arizona means another early morning hike up Picacho Peak. This stand alone mountain in Southern Arizona is located in Picacho Peak State Park in the middle of the desert. The 360° degree views at the summit of this short but challenging hike have brought us back for the 3rd year in a row. The first few times we hiked to the summit we took the Sunset Vista Trail from the north side of the park. This time we decided to switch it up and take the shorter, steeper, and more direct route to the summit via the Hunter Trail. Starting early in the morning to beat the day's hot sun, we began our ascent after parking at the southwest end of the Bartlett Loop for this 4 mile round trip hike. Two to three hours are recommended to complete this hike. Don't forget lots of water! View the Parks' home page HERE. The scenery does not disappoint in Southern Arizona, Moose backdropped by the Casa Grande Mountains. The Hunter Trail, while short, is not easy and should not be underestimated. Its trails are steep, contain many loose rock slides, and require the use of rungs and ladders. Much of the trail is located cliff side with precipitous drop offs. With that being said, the obstacles of this trail are what make it exciting, adventurous, and worth the return! One advantage of hiking in the desert, and on this trail in particular, is that without the trees blocking the view, many parts of the trail are visible from any point. It is fun to see hikers climbing ahead where you will be soon or looking behind to see how far you've come. 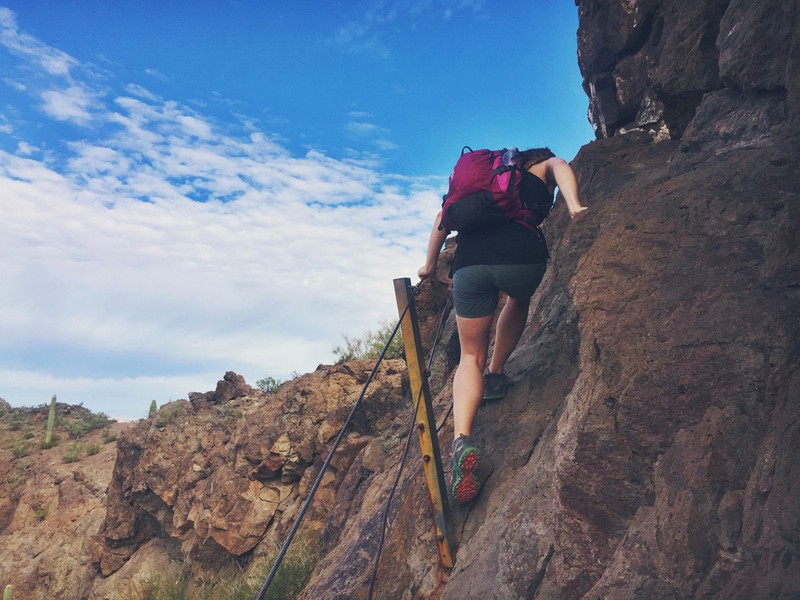 It is a popular peak during the winter months and many schools, camps, and hiking groups frequent the state park to attempt Picacho Peak. 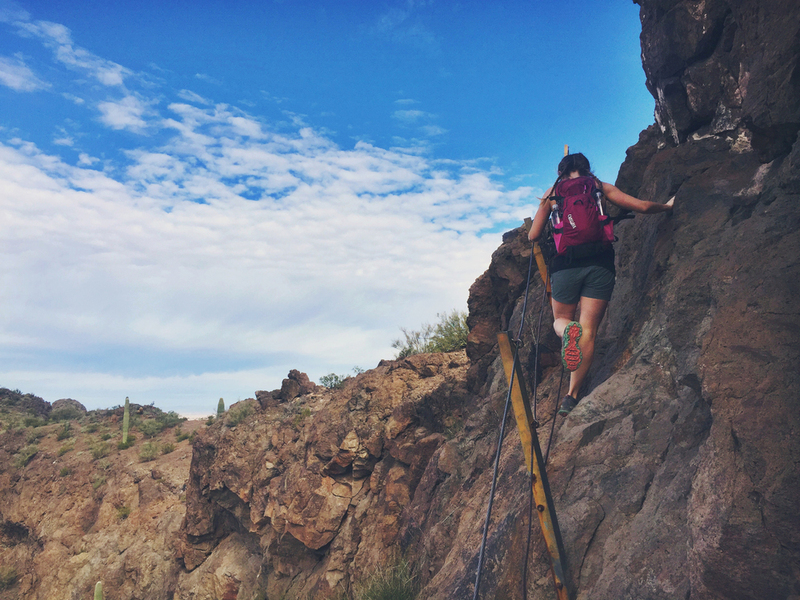 Many cliff-side views await hikers at Picacho. Teton makes his way up the mountainside. After a few miles of tough uphill we reach the saddle of the mountain where the Sunset Vista Trail merges with the Hunter Trail. We were familiar with what was to come and knew we were getting close! Following the series of rungs, ropes, ladders, and gated cliffside planks, we ran the last section of the trail to reach the peak. 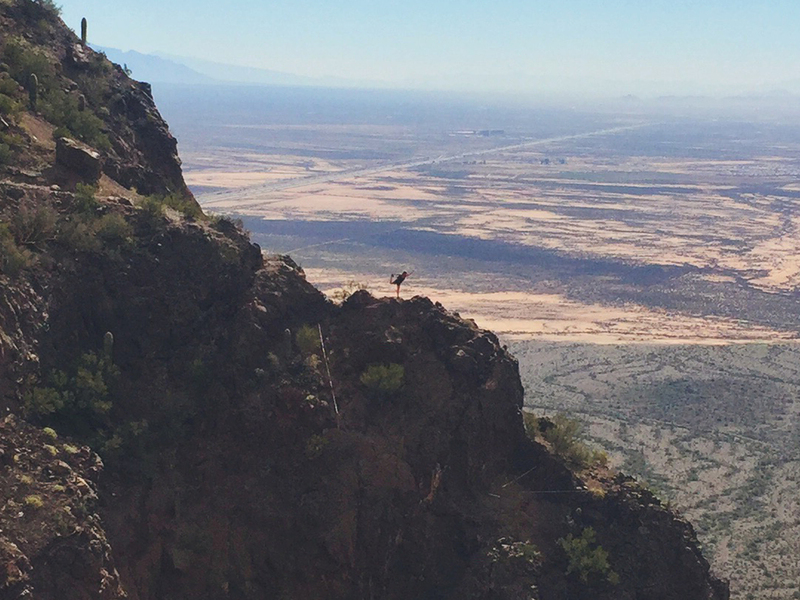 No matter how many times we visit Picacho, the spectacular beauty of the vast Arizona desert from 3,374 feet is never disappointing. As tradition stands, we ran our way down to the car, racing the hot sun back to the pool.